Okay so this feels like a silly thing from my list, but as a man it really feels like a right of passage to fix something with duct tape. 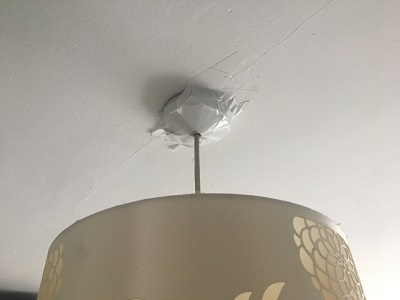 Right so a bit of backstory here – for the last year or so this light fixture was hanging a bit from the ceiling from the kitchen, to the point where I couldn’t pass underneath it without the bottom of the shade touching the top of my head. 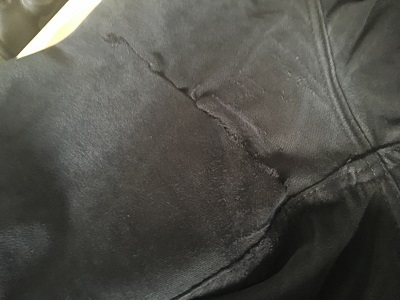 It got knocked by my husband when something frustrated him… and it had been getting lower and lower ever since. I know that this is a temporary solution, but this can wait until we have the chance to give the kitchen a bit of a face-lift. I’m just happy (and a bit surprised) that you can get duct tape in white – if it wasn’t for some of my clumsy folds then you wouldn’t notice the fix. I guess I can count that as a victory. A manly victory. With duct tape! b) how lucky we have been with the rain, I know we had a storm yesterday morning, but it didn’t effect us too badly. 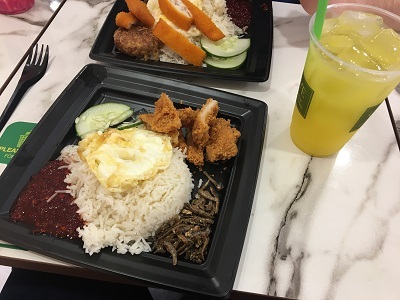 With a lot left to do here in Singapore there’s nothing better to get you started than a breakfast of nasi lamak right as you get ready to explore. Today’s first destination was Little India, based on a lot of recommendations that I saw online. Most of these are centred on the major temples (one of which was sadly closed for reparations) and the Tekka wet market. 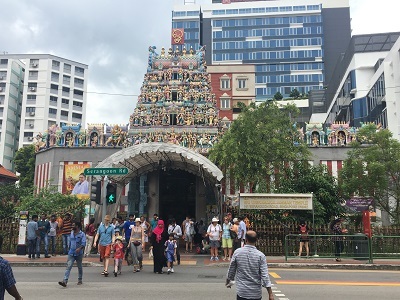 Aside from the temples themselves, it’s safe to say that Little India isn’t the best looking or the best maintained area of Singapore that I’ve been to. I guess I went into there expecting a cavalcade of colours and lots of nice smells (similar to walking through Chinatown), so I was probably always going to be a bit disappointed? However, this was worth the trip for some of the sights. 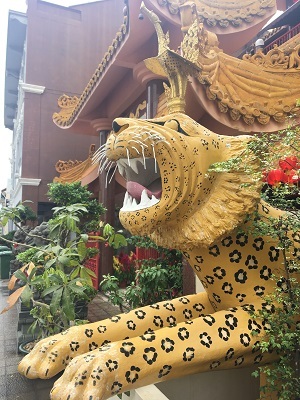 After breakfast, and a brief rain shower, our first stop was the Sakaya Muni Buddha Gaya Temple (or the Temple of 1000 Lights) – a Buddhist temple with some cool tigers on the outside and a 15 foot tall Buddha statue on the inside. 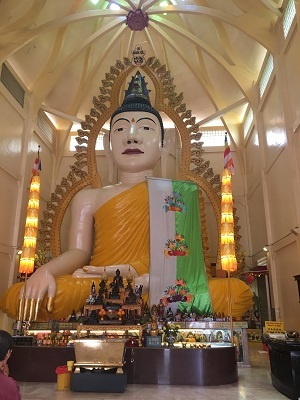 It’s one of the smaller temples that I’ve visited, but I always appreciate a large Buddha statue. 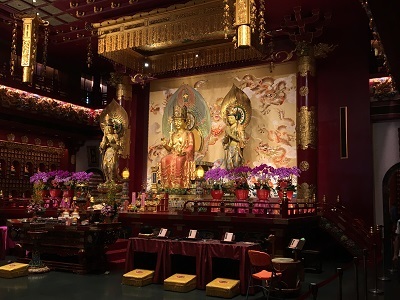 Maybe one day I’ll see the Spring Temple Buddha, but somehow I doubt I will. From here our next stop, after the closed temple, was the Sri Veeramakaliamman Temple. 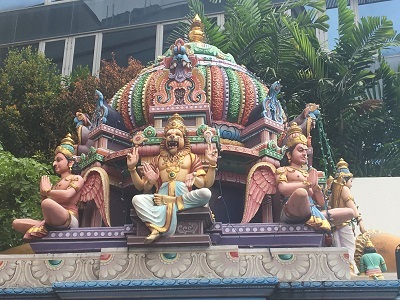 This is the oldest Hindu Temple in Singapore is definitely one of the most colourful temples that I have ever seen. 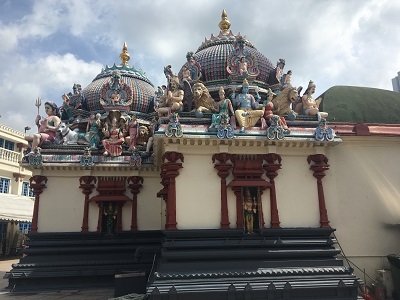 I know nowhere near enough about the Hindu faith to understand a lot of the symbolism, but this temple was such a sensory clash as we walked around (some of the loud music might have been part of this). One day I would really love or go to a place like this and have someone explain what I’m seeing – maybe when I end up going to India in the future this is something to look into. Near this temple was the Former House of Tan Teng Niah. 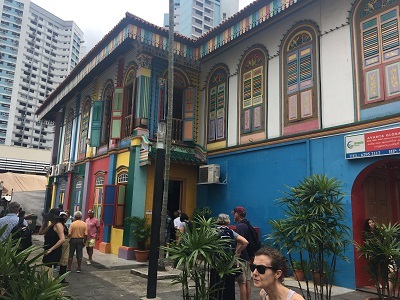 People come here because it is touted as being the most colourful building in Singapore. I don’t think I could disagree here, based on the variety and the heavy use of colours on this house. It appears that this house, which is a former Chinese villa, is mostly used to store products for the stalls that now operate outside of it. A pity really as I’d be really interested to see what I might have been like inside. The final stop in Little India was the Tekka wet market. 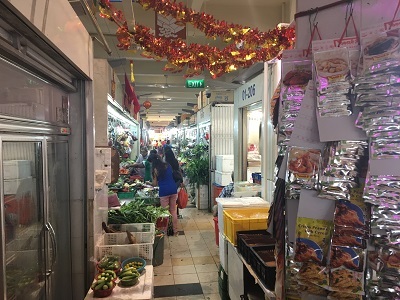 I was going here to try and find some fruit for my food list (which didn’t work out, partially as no one labels anything) and just look around the stalls. I probably would have spent longer there if everything didn’t smell of raw lamb, but at least it was interesting to see what was on offer. Back in Chinatown again where I have finally found a place where I could try prepared birds nest without leaving a massive hole in my wallet. 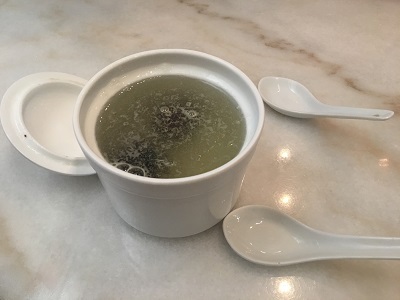 This portion of birds nest with rock sugar cost me $12, which is still a fair bit of money but a lot less than most other places. This is one of those food items that is on the 1001 list because of the texture as this really doesn’t taste of anything. What it does do, however, is give a dish a pleasing jelly-like texture. There is also a believe in Chinese medicine that birds nest is good for you, so maybe this has done me some good. The rest of the day was spent with us doing the Southern Ridges nature trail. We decided against the treetop walk in the north of the island as this was easier to get to and, should a thunderstorm have hit, we would have the opportunity to bail out. The walk itself is about 10 kilometres long and it took us about three and a half hours to complete. We actually did this in the reverse order of what is published on the website as we wanted to end our day at the harbour front rather than in the middle of some science park. 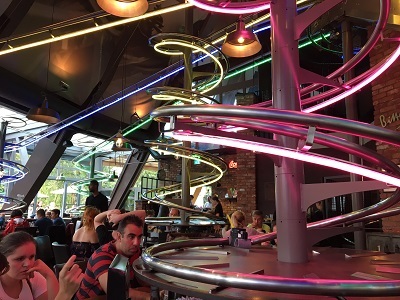 Also, by doing this in reverse order, it feels like we spent most of the time going up – so I guess that’ll help balance out the late night fruit and Fanta Lychee. It’s really cool how this trail joins together a lot of different green spaces and does so with a lot of different walk styles. 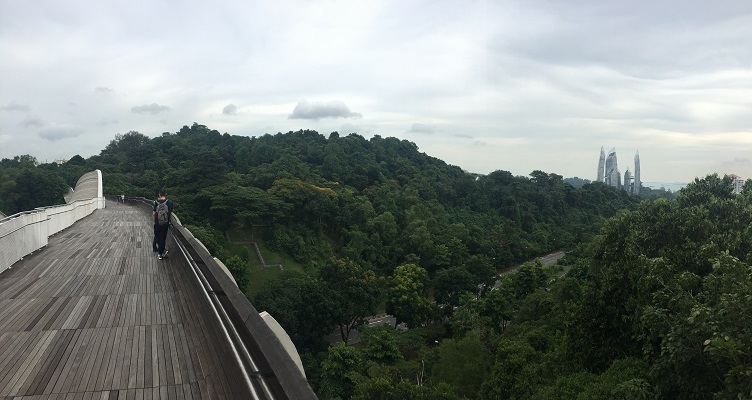 There is a section where you go on a long canopy walk across a series of metal platforms, you cross some interesting and architecturally interesting bridges and, at the end for us, you find yourself at the top of Mount Faber where you can look back over the city or look over to Sentosa. For me there were two highlights. 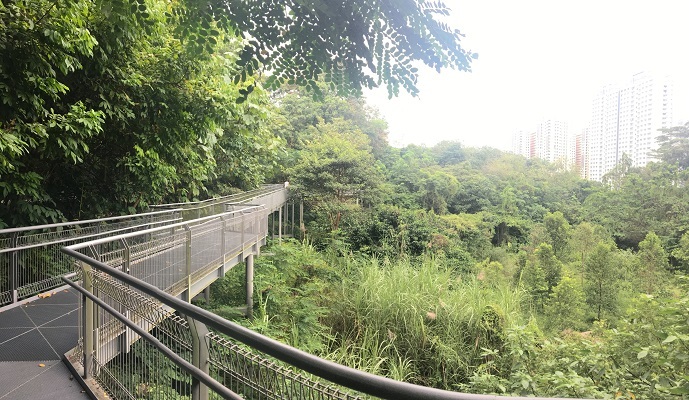 The first was the Henderson Waves bridge. Not only is this wood-panelled bridge really interesting to look at architecturally but, because it is highest pedestrian bridge in Singapore, it also has the best views that you can get on this walk. 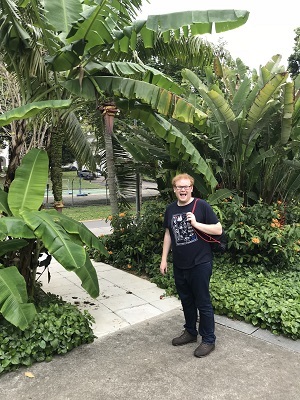 The other highlight was actually seeing banana trees! I can’t believe that yesterday I wrote about wanting to see this (having just seen pineapples) and here I am now seeing a banana tree. I know this is a silly goal, but seeing how they grow in real life just made me very happy (as you can see from the picture). So, after 3 and a half hours of walking what do you think we did? Kept on walking for another kilometre across the boardwalk and into Sentosa. You know, it was there for the walking after all and I don’t think we were quite tired enough! It was a great opportunity to get some nice pictures from the boardwalk and truly got our appetites going for dinner. 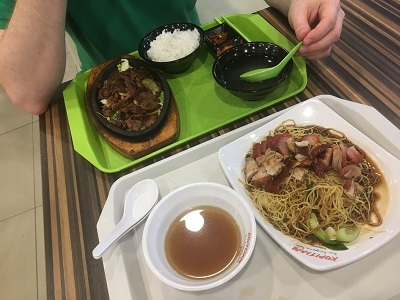 For our final dinner (not including the airport tomorrow) we went to a hawker-style centre in the Vivo shopping centre and got a whole bunch of different things. 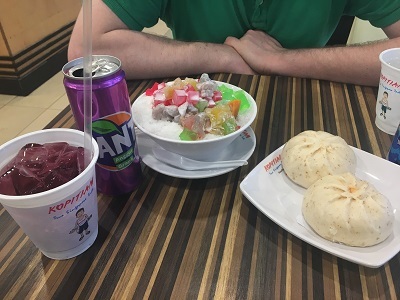 What you are seeing here is a Korean barbecue beef set, char siu and duck noodles, two barbecue chicken buns, Fanta Grape (blech) and something called bo bo cha cha. The last one of these is an interesting desert containing coconut milk and pieces of sweet potato and yam. Apparently that’s a thing, and I liked it. So tomorrow is the last day in Singapore. Going to try and mop up some loose ends whilst getting some much needed souvenir shopping done. The rains happened as the weatherman predicted. We woke up to some showers, which gave us pause as to what to do today. Then they appeared to have stopped, so it was back to the originally scheduled idea. 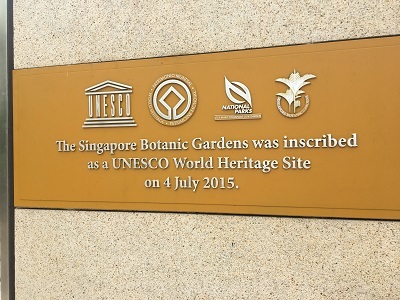 The Singapore Botanic Gardens are one of three gardens around the world to have been designated as a UNESCO World Heritage Site as well as being the sole World Heritage Site in Singapore. Oh, and they’re free to enter. 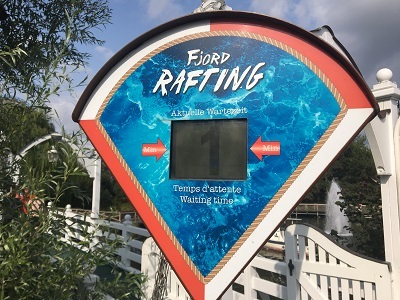 This really means that there is no excuse to not see these whilst in the country – especially because they have their own subway station with an escalator leading right to one of the garden’s main entrances. 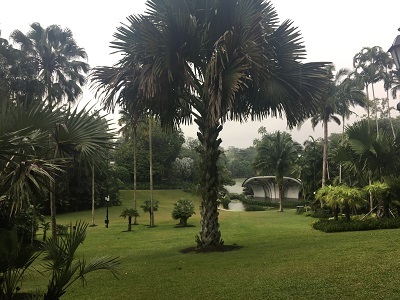 Unlike a lot of other major gardens that I’ve been to, the ones at Singapore are completely out in the open. 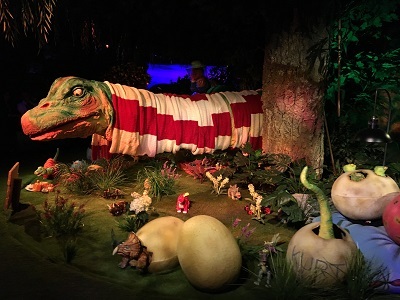 I guess that, with Singapore being a tropical country, there is no need for hot houses whereas in countries like Denmark and the UK we have frosts that would kill off tropical plants. 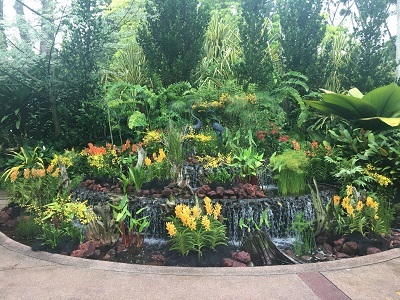 By being completely open there is more a feeling of inclusivity and informality to the Singapore Botanic Gardens despite, in Singaporean style, there being a lot of signs displaying the rules, regulations and possible fines. 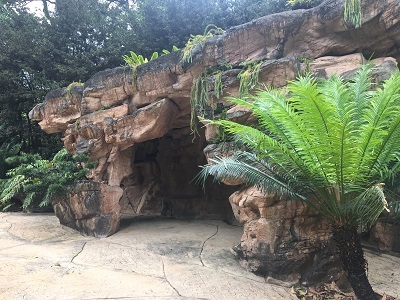 However, this is still a set of proper gardens and so has a number of interesting sections including an ‘evolution walk’, where petrified wood is displayed, and a medicinal garden that contains plants that have been used for medical purposes. This is one of the weirder things from my list, and was added alongside wanting to see natural growing bananas. I’ve always been fascinated by the idea of pineapples growing up from the ground like this and now I’ve seen it for myself. As well as a papaya tree. Now, it was around this time that the rain started to spit, so we made a beeline for the nearest food place (as we hadn’t had breakfast) so we could try and ride out the rain. 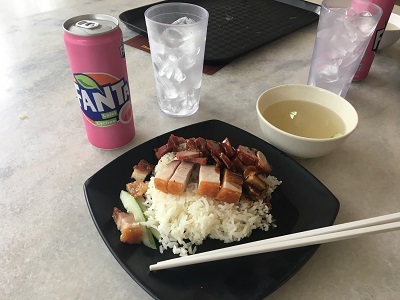 It felt like a mini-hawker place and so we were able to get brunch for a total of $11, which included the new love of my life: Fanta Lychee. Im not usually a bit Fanta fan, but I can make a huge exception for this. Half and hour later and the rain wasn’t letting up. In fact it was now worse and we could hear thunder rolling in the distance. So we did what any smart person would do – walk around the gardens with out umbrellas up. I know this isn’t the best thing to do in a thunderstorm, but we couldn’t just stay inside for the rest of the morning! So this was the rest of our morning in the gardens: walking quickly with the umbrellas up and admiring the scenery in the rain. Palm Valley, where they sometimes hold concerts, was especially beautiful – even in the rain. 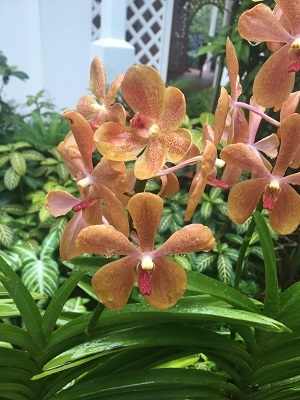 No visit to the Singapore Botanic Gardens is complete without a visit to the orchid gardens. It’s the only part of the gardens where you have to pay for admission ($5 each) and you get to see a fantastically well laid out area filed with all manner of different orchids. This part of the garden also houses the ‘V.I.P. 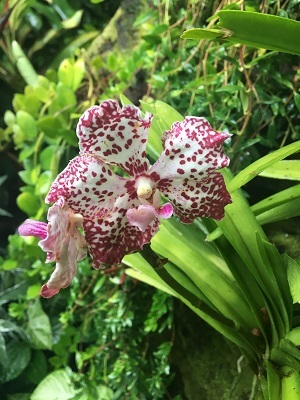 Orchids’ that have been named in honour of visiting dignitaries as part of Singapore’s ‘Orchid Diplomacy’. Some of these are more recent, like the orchid for Dutch Prime Minister Mark Rutte, and others, like the one for Margaret Thatcher, have been cultivated for decades. It’s really interesting to see how the names and the orchids match up. Given that it was still raining, and time was getting on, I bought some refreshing melon milk from a vending machine and we made our way back to the subway to head for our next destination for day: Sentosa. 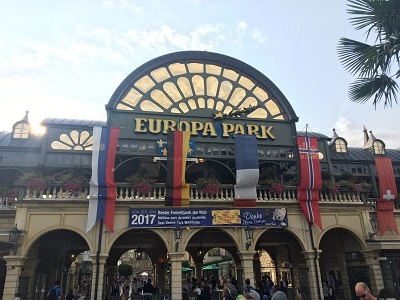 Our visit to Sentosa got off to a rocky start as there was a problem with their machine redeeming our pre-bought tickets. Half an hour waiting at the counter to be told that we would have to pay again in cash and then wait on a refund to be done in the next five days. Hardly ideal, especially as there was no refund receipt that they were able to give out… so just a bit of a warning there. Anyway, that unpleasantness aside, we were here for the oceanarium… which was closing an hour early some some unknown reason. Pushing forward though! 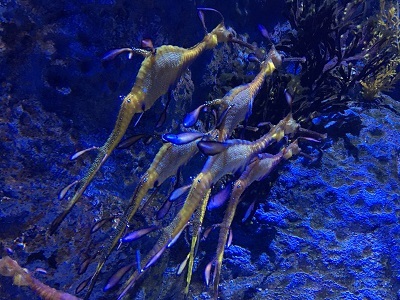 This oceanarium was excellent. 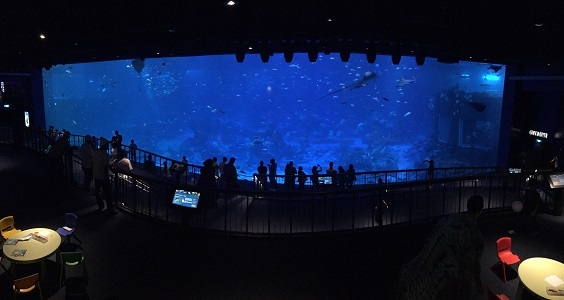 I mean, I am a real sucker for a good aquarium but this is one that, until recently, boasted the largest viewing panel for a single tank in the world. More on that room later, because that really was special. 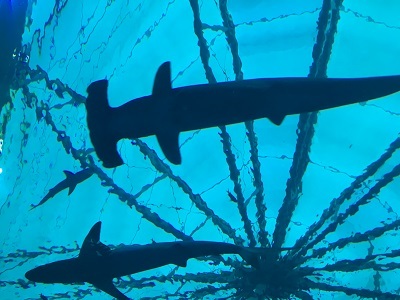 I also really appreciated that a lot of the glass on the front of the tanks appeared to be anti-reflective, which made it a lot easier to take pictures of the more interesting residents like the nautiluses, hammerhead sharks and sea dragons. The real highlight, as I previously mentioned, was this big tank and the three manta rays that lived inside. 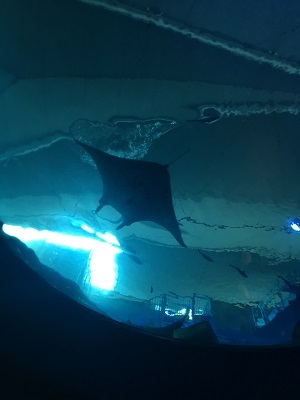 Sure there were a myriad of other fish in there including unicorn fish, tuna and other rays, but I was here for the manta rays. If the aquarium had closed at its normal time I could have easily just sat there watching this tank for a solid hour. Still though, I had plenty of time with the rays and now I am left with whale sharks as the final ‘must see’ animal on my list. 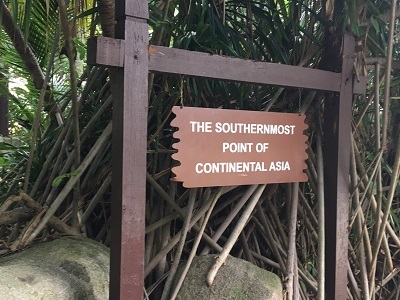 Since we had some time before the water show (whose tickets gave us the problem earlier) we decided to explore the island of Sentosa for a bit – which lead us to an islet dubbed as the ‘southern most point in mainland Asia’. A cool moment for the hub as he could say, with some certainty, that this is the furthest south that he has ever been. Dinner at this resort island of Sentosa ended up being ramen. 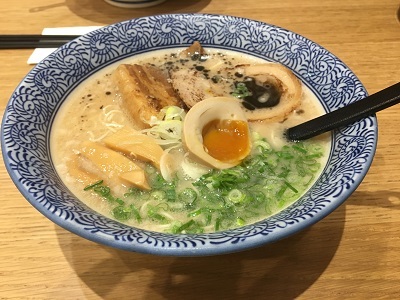 It’s been so long since I’ve had a ramen this good (probably not since Japan) and, considering that we were in a touristy area, it was reasonably priced. 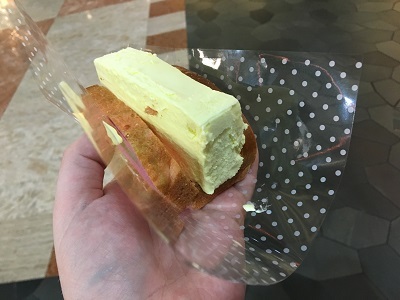 For dessert, I had a very literal durian ice cream sandwich (yes, that is bread wrapped around a block of ice cream) which helped to change my mind on the taste of durian. As an ice cream it tasted like rum raisin, which just happens to be my favourite flavour. 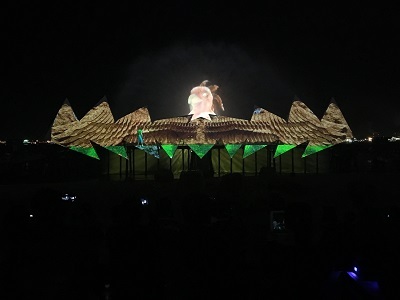 We finished the night with the Wings of Time water and lights show. 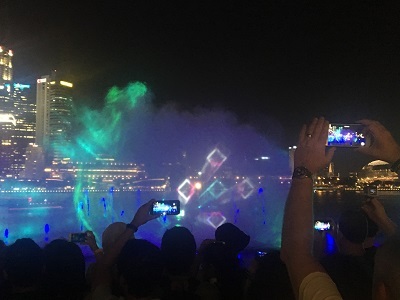 It was technically impressive with flamethrowers and fireworks alongside the projected images on water. However, this was very much aimed to be family friendly and I found myself rolling my eyes when two of the characters in the show began to sing a song about achieving dreams (because I’m dead inside). It had a lot to live up to after the more abstract water show that I caught two days previously, and I think that it lacked some of the heart and the authenticity that the other show had. Still, it was entertaining. So this leaves tomorrow as the last full day. The weather is set to rain all day, but weather reports here change on a dime, so I guess it’s a game of wait and see. The jetlag almost got me! I was awake at 4:30 this morning and it took me an hour to go back to sleep again. Take that jet lag… please don’t get me tonight. 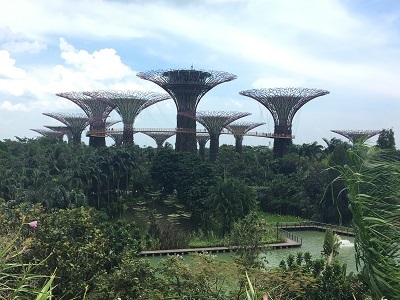 So, today was the first full day in Singapore and it feels like we got an awful lot done, which I’m very pleased about because it’s very hard to do anything when it is 32 degrees and the air feels so thick that you might be able to bite a chunk out of it. Still, this is a holiday and this beats the -2 degree weather that we were having in the UK as as left. 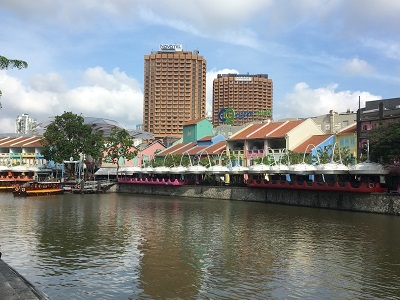 To start off we took a walk up to Clarke Quay to try and find something for breakfast. Sadly most of the things were closed, but we still had a nice walk around the closed up shops and used this as a reminder that Singapore is a city state that draws its life from the water. A lot of the restaurants looked pretty touristy anyway, so it was probably for the best that we bought some pastries in a nearby shopping mall. 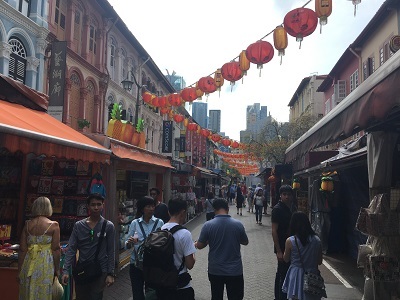 The first main thing on the itinerary was to finish off our exploration of Singapore’s Chinatown. This possibly the nicest of all the Chinatowns that I have seen (thus taking the title from Toronto) because of how well maintained it is. I mean, the New Years decorations help, but the Food Street and the main market street are so well done that, for the first time, I really enjoyed having a peruse through some of the stalls. I hadn’t even thought about this goal for ages! Nice to know that some of these can occur without me even really thinking about it. Anyway, this temple had a lot of beautifully painted carvings of Hindu deities. You can tell that this was recently renovated as the colours are still incredibly vibrant. 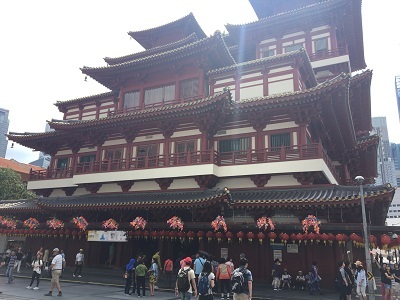 After this we walked down the street to visit the Buddha Tooth Relic Temple. Just by stepping into the courtyard everything felt just that bit cooler than the outside world (this felt like some kind of miracle), and then we entered the hall of the 100 Buddhas. The amount of gold and statues on display was astounding. Also, since we are in Singapore and this temple is only 11 years old, they are a lot more free with people taking pictures. It’s not a huge temple (you can see more floors if you’re on a pre-booked tour), but the ornamentation really does pack a punch. From here it was onto a small bit for brunch (we had a lot of small shared meals today) at a nearby hawker centre (a different one from the day before). Why? 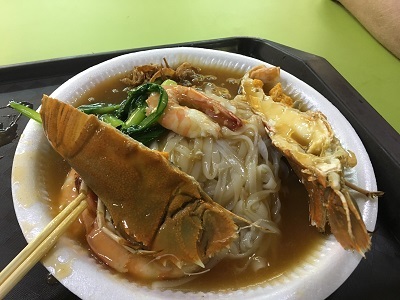 Because I have been researching places where I could find foods from the 1001 list and I found a place that did this rather unfortunately named crustacean. So this name is the Australian name, but this is also known as slipper lobster or (in Singapore) crayfish. Looking at the shells on the crayfish, I am satisfied that this is the correct seafood for the list. It helps that this ‘crayfish’ tasted great, with meat so tender that I could just whip it out of the shell using chopsticks. It tasted like sweet lobster tail meat and this went very well with the peppery sauce. Considering the price, this is something that I would seek out if it was available in the UK. From here we began our walk to the Gardens by the Bay. In total it is only about 40-45 minutes to walk there from Chinatown. It would be faster to use the subway, but where’s the fun in that? 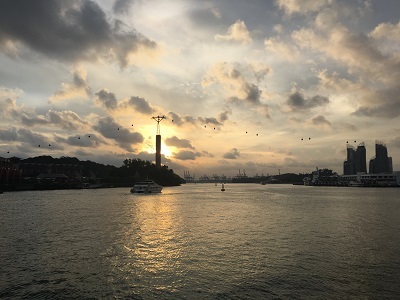 By doing this walk we started to get to know the Marina Bay region with fantastic view of the Singapore skyline plus a first sight of the weird and iconic Marina Bay Sands building. 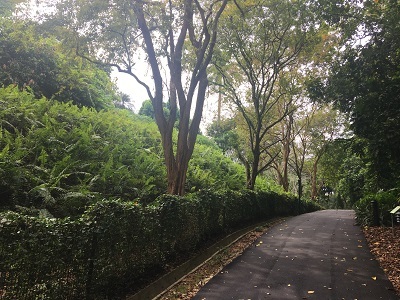 It was on this walk where I really began to think that Singapore could be an ideal place to live – if it was an average of 5 degrees cooler that is. This is the first of two Lonely Planet places in Singapore and it is the one that I have been looking forward to the most. 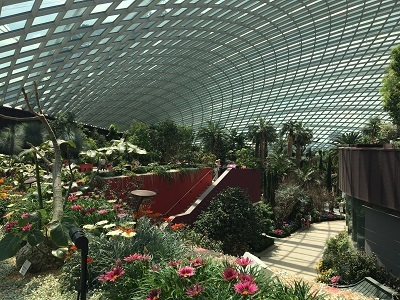 I do love gardens and areas of green within a city, but I don’t think there is any in the world quite like that Gardens By The Bay. The first things that demand your attention are the Supertrees. 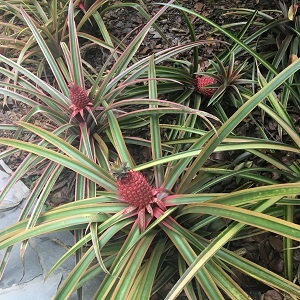 They are of varying size, but are all very tall and covered in climbing bromeliads. Of course we had to walk along the Supertree Grove walkway. It helped give a better view of the surroundings and allowed a closer look at some of the orchids that were flowering near the top. It’s a little bit steep at $8 a ticket, but the majority of the garden is free, so I really cannot complain. 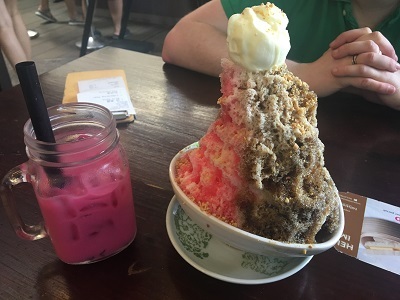 Due to the long walk and the increasing temperature we were in need of refreshment, so we shared this pile of flavoured ice (called ice kacang) as a small lunch. This pretty much solved my dehydration problem whilst also being really delicious. The fact that, beneath the multicoloured flavoured ice, there were sweet beans, grass jelly cubes and other things just added to the enjoyment. With enough water to keep me going for a while, we went to the Flower Dome. Sadly the Cloud Garden was closed for maintenance, but there was more than enough to see in the Flower Dome to keep us happy. The temperature in the dome is set to be an eternal Mediterranean spring day, which means that it was ideal. This enclosed garden houses plants from a number of different regions of the world that exhibit a Mediterranean climate. Amongst the plants were carvings and some sculptures (including an incredibly impressive wooden dragon) which helped to add to the flavour of the garden. We were technically there at a time where thy were dismantling a flower exhibition on dahlias to make way for a future exhibition, but most of it was thankfully left in tact. 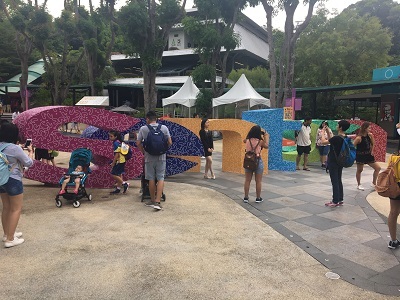 It was with much reluctance that we left the cool temperature of the Flower Dome, but we took this as the opportunity to go to the hawker style area called Satay by the Bay to eat, well, satay. 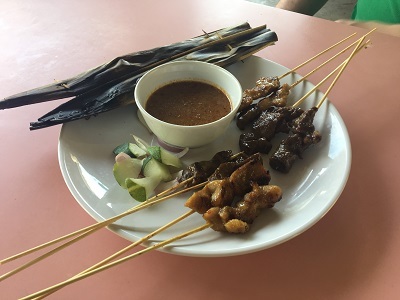 10 sticks of assorted satay for $7 – and people were telling me about how expensive Singapore is. I guess it’s a perspective thing, also knowing where to get the cheap eats. 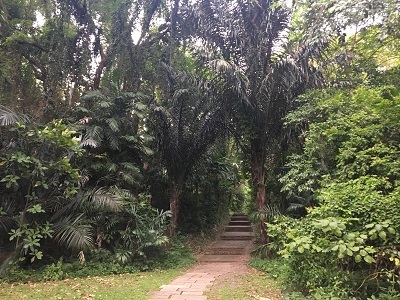 We wandered around the garden a bit more after this, making visits to the Indian Garden, the Chinese Garden and the Web of Life (which contains topiaries of a number of local species including the orangutan and the fig wasp). We spent a good 4 hours in the gardens and it was time to visit the building that towers over them: Marina Bay Sands. 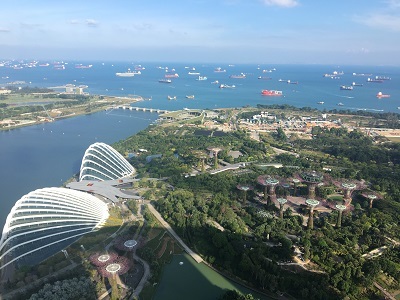 With Singapore’s big Ferris wheel out of commission the best place to get an aerial view of the island is from the Marina Bay Sands Skypark on its 56th floor. It’s priced a bit steeply at $23 each, but this is a once in a lifetime thing and it really paid off once we were up there. 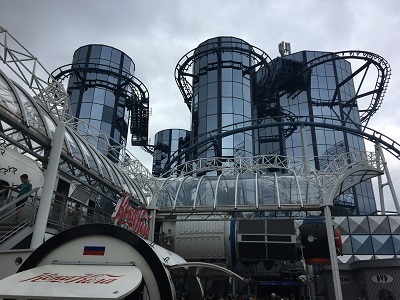 This must be one of the few viewing platforms in the world where you can see three different countries – in this instance: Singapore, Malaysia and Indonesia. The views that you can get of the surrounding are are excellent, plus there is plenty of room on the deck to sit in the shade and just admire the view. Something we did for quite a while. For our final stop, we walked to the nearby Marina Link Mall where I had this beauty for dinner at a restaurant called Pappamia. Past me would have been initiated by the presentation of an entire fried fish, but now I’m in there scooping out flesh with the best of them. 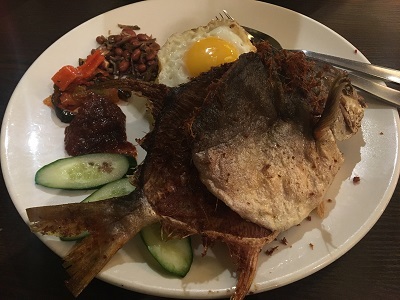 In terms of taste… I always have trouble differentiating fish. From eating it you can tell that this whitefish is an ocean fish because of the slightly mineral taste in the flesh. It’s also worth noting that this fish didn’t really have a fishy tast. Could I identify this in a blind taste test? No, but that doesn’t stop it from being delicious. Now, this this was to going to be the end of the day whereby we would walk back to the hotel and admire the city as it was all lit up (which, as you can see from the pictures, is beautiful) but luck had a different plan for us. We were walking by the Event Plaza of Marina Bay and we saw a huge crowd gathering. Turns out it was for the nightly water and lights show (called Spectra) and we were bang on time. Over the next 15 minutes I was completely taken in by the synchronised fountains, lasers, music and superimposed images of mandalas, animals and other cultural icons. It’s a bit embarrassing to admit this, but this show managed to move me to tears in its third act. Amazing considering that this was free! So yea, for a day that was going to be a bit of a slight lean into Singapore in order to get over the jet lag, this became a bit of a mega day. We got lucky that we had no rainfall, but I don’t think we’ll be as lucky tomorrow as we visit Singapore’s many zoos. It’s been 13 years, but I’ve finally gone back to my roots and am spending some time in Germany. This will be my fourth time visiting as well as being my fourth time in Munich. Why Munich? Well it’s December and that means one thing: Christmas markets! More on that later. We arrived late on a Saturday night which meant an early night because, on our first full day, we were doing a palace tour. Why am I mentioning this? Well, I had the weird pleasure of satisfying a goal of being the first person to walk onto a plane. I know it sounds bizarre, but seeing the plane completely empty with my being the first to board made me feel incredibly important. Anyway, onto more interesting things. The older I get, the happier I am to do tours. As a bit of a control freak in my everyday life there is something soothing about having an entire day sorted for me. Of course this meant an early start (5:30 when adjusted to British time) so we could get onto the coach. So there’s me bringing a bunch of things for entertainment for these long coach stretches and then I see it: snow. 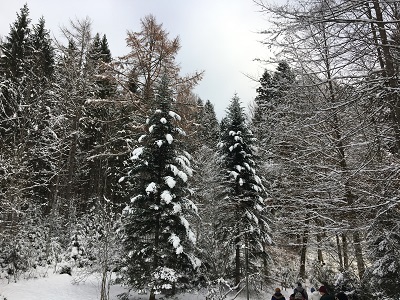 When we booked ourselves onto this tour of the palaces of Ludwig II, I really hoped there would be a bit of snow for the sake of pictures and atmosphere. I did not expect to be greeted with forests and mountains covered in a blanket of snow. 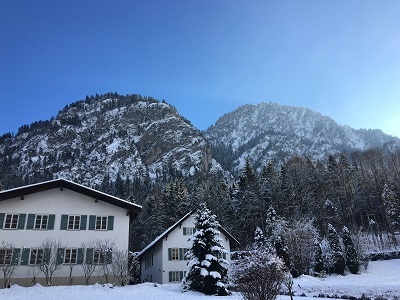 If seeing this from the coach window didn’t make me feel Christmassy enough, getting out at Linderhof, and feeling that first crunch of snow beneath my feet, was just something else. Then came the walk from the parking lot to the palace itself. Bright sunshine, glistening snow and a whole lot of crunching. 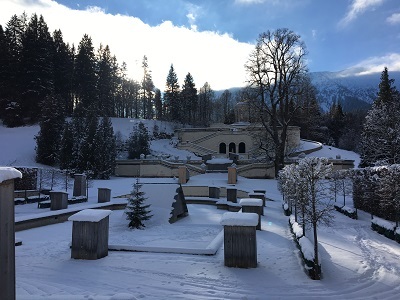 With this visit to Linderhof I have now visited the three palaces of King Ludwig II (the first I visited being Herrenchiemsee back in 1999). Interestingly, Linderhof is the only of his three palaces that ended up being completed and actually lived in by the king. 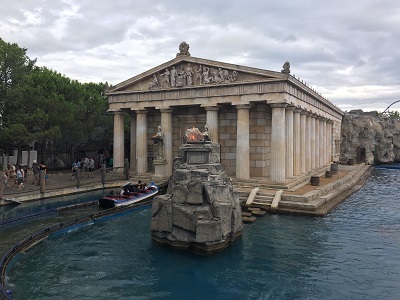 Sadly the grotto and the fountain of Neptune were under restoration work, but we still had a tour inside. Since no pictures are allowed to be taken I’m going to move on to our next stop after a few thoughts: I want a gilded peacock statue, this may be one of the most consistently ornate palaces I have ever seen and I don’t think I have ever seen so many vases in my life. 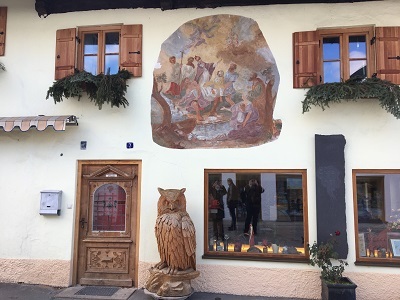 After Linderhof was a quick hop to the village of Oberammergau – most famous for their tradition of holding 6-hour long passion plays. 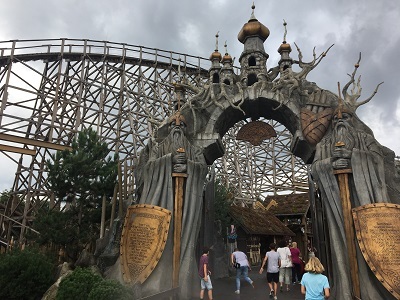 It’s also well known for having buildings painted with Germanic frescoes and traditional woodcarvings. It’s definitely a beautiful village to walk though, and that’s all we could really do. You see, today was the first Sunday in Aadvent… meaning that nothing was open except for cafes and restaurants. I mean there was a weird wood carving place open… but they were selling very offputting crafts of babies for €60 so I kinda want to leave it at that. 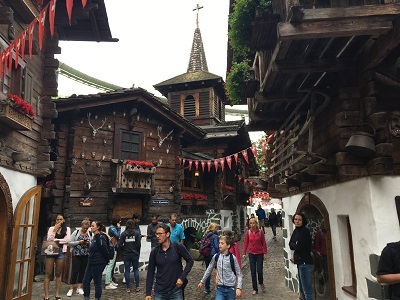 From Oberammergau it was time to head to the village of Hohenschwangau – the home of Neuschwanstein Castle. This is my second time here, but my first time inside the actual caste. At least I don’t think I went into the castle 16 years ago. I honestly cannot remember… so let’s just go with this being my first time. 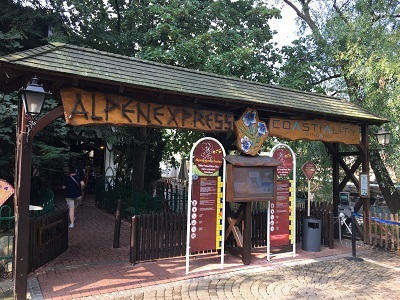 The walk from the Hohenschwangau to Neuschwanstein should take around half an hour, but that doesn’t take into account just how often we stopped to take pictures. At this point we must have taken nearly 100 pictures of various views of the castle. Kinda wish I was kidding, but the castle is just that magnetic. Little wonder that it is one of the big inspirations for the castle in Disneyland. As you get higher up the mountain, you also find yourself starting to peak above some of the tree line. 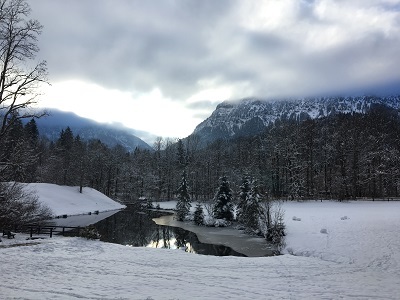 With the entire landscape covered in snow, this view you get from near Neuschwanstein is just out of this world. Like something I can imagine Bob Ross painting, just with less mountains. As with Linderhof there is no pictures allowed inside of Neuschwanstein itself. Considering the number of people that we were being herded around with this makes a lot of sense on the level of just getting people in and out. Still, it’s a pity I couldn’t get anything of the inside. Makes me wish that Google Glass had taken off and been more affordable. 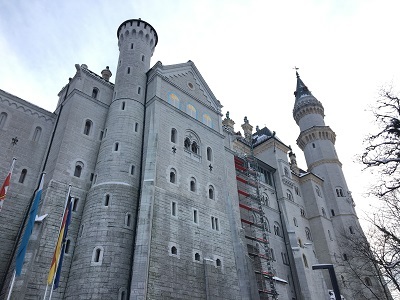 There’s so much in both of these castles that I didn’t really get the opportunity to completely digest – like the little grotto room in Neuschwanstein that seemed to make no sense other than being pretty. The fact that there is so much in Neuschwanstein to see and yet it remains unfinished is absolutely mind-boggling. Then again, there was no way that Ludwig could complete this due to the extreme cost. Same with Herrenchiemsee, another of his unfinished palaces. To think that a man like Ludwig could be so out of touch with reality and had a high enough of a position to actually carry out his fantasies probably goes a long way to explain why few countries have a monarchy. Still, makes for some excellent landmarks. This was the end of the tour and meant a two hour ride back to Munich. En route we caught a glimpse of a blood red supermoon and it started to snow. King Ludwig would have really been in his element tonight. I only wish I was sitting on the right side of the coach in order to capture this scene on film. 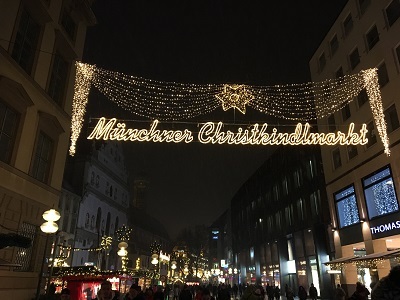 On our way back to the hotel we took out first proper browse through the Munich Christmas Market. 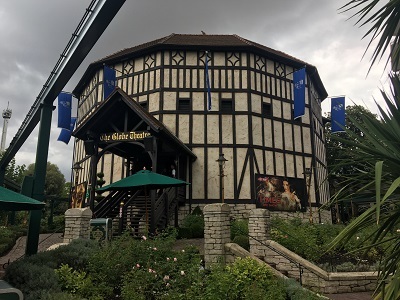 Whilst it isn’t as large as the one in Vienna, this holds a special place in my heart because it’s the first one I ever visited. 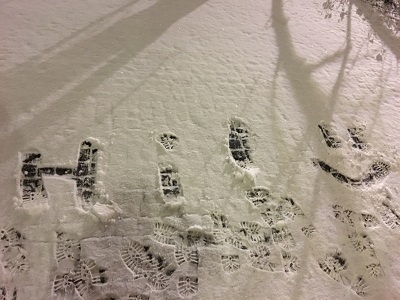 The falling snow made the walk home so special that I was feeling giddy (or that might have been the hot chocolate). This isn’t the clumpy snow we get in the UK, but proper beautiful powder snow that crunches beneath your feet as you walk through the street. I’m sure we’ll have a proper go at the market in the next few days when we are less tired from a long day being guided around. I’ve seen a few decorations that I want to purchase, but I’m going to just see where the days take me. To quote Sufjan Stevens, “it’s Christmas in July”. Man I love Christmas, and I miss the Christmas season whenever I see a set of twinkly lights and it is not December. 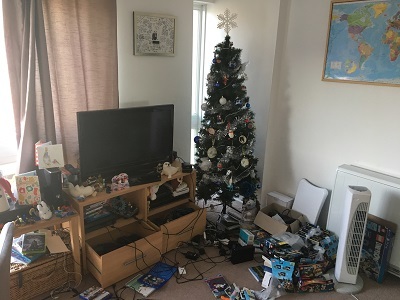 As a couple we really made out like bandits this Christmas, but the big ticket item was a brand new TV from my mum that we got as a joint present. I also got a Nintendo 64 from the hub and have found solace in a bit of Pokémon Snap. 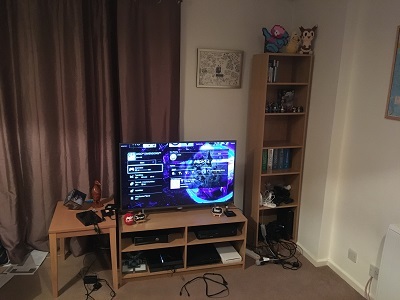 Still, with this new TV and the ever expanding collection of Lego Dimensions figurines and Amiibos it was time for a new TV stand and an actual bookshelf in the living room. 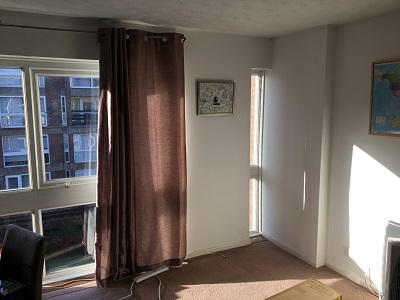 It was only a few hours after deciding on new furniture before we had two flat-packs from Argos delivered to our flat. Same day delivery between Christmas and New Year? Man I love Argos. Now I am a master of the flat-pack. Most of the bedroom furniture that I had growing up were flat-packs from Ikea or Argos. Sometimes I end up building it upside down and then having to rebuild it, but the screws are just that easier to put back in once you’ve widened the holes. This was one of the first times I made some flat-pack with the hub apart from some white Ikea bookshelves of little consequence. Because hammers and screwdrivers come out (and because we’re competitivr with each other) these builds weren’t always the most chilled. Still though, it was fun and we ended up with a nice new bit of storage. Also my Porygon Lego sculpture now has a place to perch. Probably a lot more that we could do with the place, but there’s no rush. Many people know this about me, but I am not the biggest fan of New Year’s Eve. So many people put way too much importance to something that just leaves me cold… so I tend to prefer spending New Year’s at home watching a movie. I never did things for New Year’s before meeting the hub since it’s actually a big deal for his family. After a few times of being over in the Netherlands we are finally doing New Year’s in London to try it out in the big city. Right so I was not too happy about doing this. I actually contemplated feigning illness instead of going up to London and dealing with all the ‘merriment’ and waiting in the cold. Still, I couldn’t be that selfish now could I. 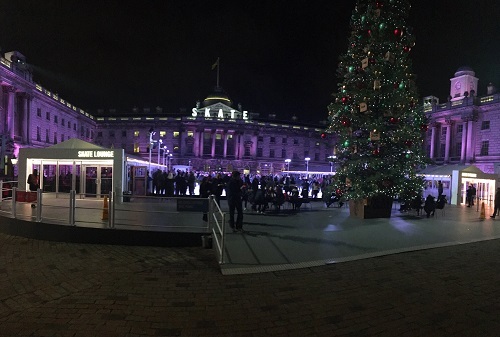 We actually booked tickets to see the fireworks from the balcony of Somerset House. Sure, it’s a bit more expensive than the tickets to see it in the street, but it was sure done up pretty. Apparently we were meant to get a quarter bottle of champagne with every ticket… but that never materialised. 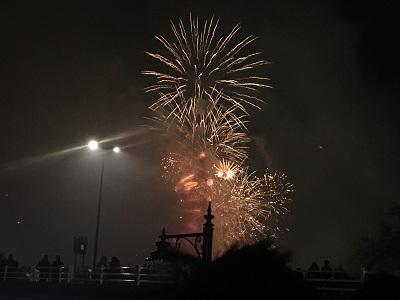 Still, we were there having gorged ourselves on Korean food at Asadal near Holborn Tube Station and waited for the fireworks to begin. We had to be subjected to a lot of music that sounded the same (at 27 I am already feeling that old apparently) and bore witness to a trio of guys sneaking onto the balcony by jumping from the roof of a neighbouring building. There was good will all around and I did a bit of chair dancing when the DJ started playing ‘When Doves Cry’. I know these wouldn’t have been as big as those in Sydney. I still stood there with goosebumps and my eyes wide at the bright and smokey spectacle. There was a bit where, in the music mix, the mayor of London saying ‘London is open’ and I teared up. I may not be proud to be a Brit or an Englishman at the moment, but hot damn am I proud to be a Londoner. Despite my protestation and my feelings of the contrary, I had a great time. It’s one of those things that people should try to experience even if they are big ol’ cynics about New Year’s Eve. Wouldn’t quite say that I am a convert to this odd ritual, bu I feel as if I understand the sentiment that little bit more. 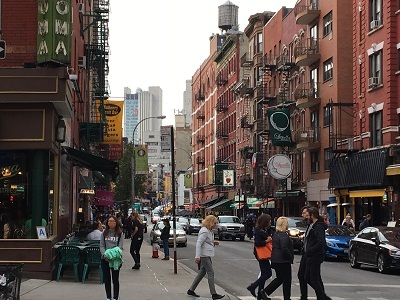 One thing that everyone should do when they come to New York is explore some of the neighbourhoods on foot. It’s really great to visit all the museums (and honestly I wish I could have fitted in the Cloisters museum… maybe next time), but sometimes you want to spend a day completely outdoors. It was a light breakfast of an everything bagel with cream cheese and peach Snapple before we made for the High Line. 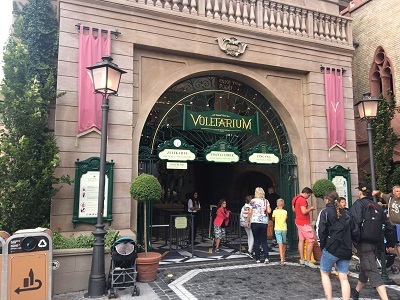 Now, this attraction was not open when I was last in New York. I missed it by a few months, but would have likely not heard of it anyway. Still, I was keen to visit this since this has become increasingly popular. This is something I cannot see happening in London. 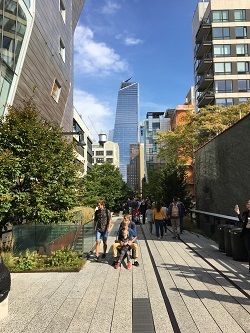 What you have on the High Line is a disused raised railway line that has been re-purposed into a nearly 2 mile long garden/walkway over the streets of Manhattan. 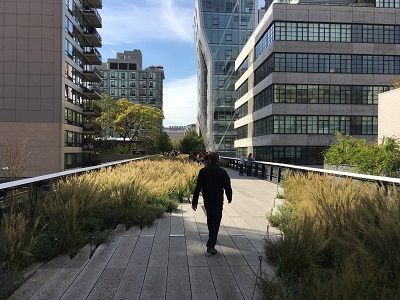 At times it felt almost peaceful (not always since the High Line was spurred on a lot of property redevelopment), but this is a place where wildflowers can grow and you can actually hear birds singing above 26th Street. It also functions as a space for art. 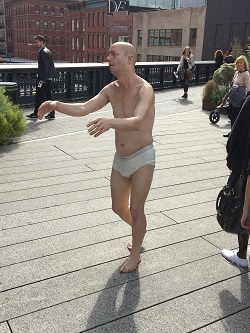 Some of them are a bit odd (think a concrete ball shaped like a watermelon hidden in the grass) and others were weird in a fun way (like this realistic sculpture of a sleepwalker in his underwear. 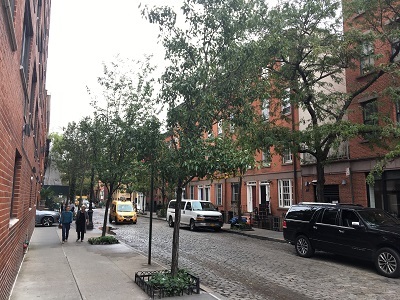 When we descended back onto solid ground we walked through our first neighbourhood of the day: Greenwich Village aka the home of TV’s Friends. When you go through the village it becomes incredibly obvious that this is very much a lived in city. I made sure we walked down Bleecker because, you know, it’s one of those well known streets. A bit of a diverted walking route later and we arrived at our destination for lunch. The idea of eating at Michelin starred restaurant was a very early thing to be included on my bucket list. It has taken a few years for me to get around to crossing this off because these restaurants are on the pricier side. 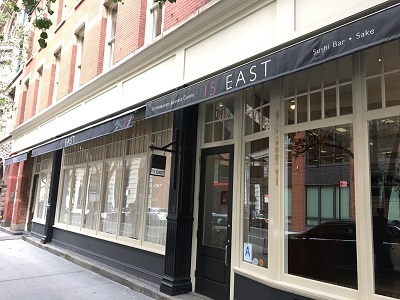 Enter 15 East. I am not going to say this was a cheap meal. Heavens no. We ended up having 9 pieces of sushi each (so 18 in total) and the bill came to almost exactly $100 for two people. For the experience and the sheer “hell yea I can be fancy” it was worth it. Also for the forced and restrained politeness from the server. She was very much looking down on us… and I don’t think it helped when I asked for a replacement ice water because the one she poured had a fly in it. 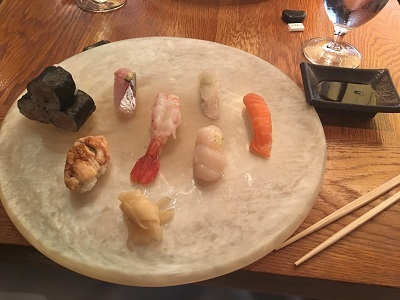 We started out with a sushi omakase (1 piece not pictured as it was eaten) and this chefs choice plate was absolutely gorgeous. Both the sweet prawn (whose tail cut my lip) and the citrus scallop were especially delicious. It was only after finishing these, and checking out the a la carte menu, that I realised that there was a list fish on this plate. Just a shame that I didn’t know until it was too late and was not able to note down anything. Since the omakase didn’t fill us we ordered some more off of the a la carte menu. This meant we were able to cross two more fish off the list. 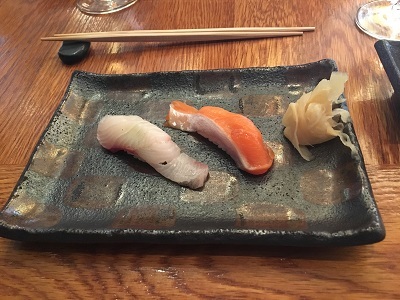 The first we tried (the white one) was the kanpachi – a type of amberjack. It had a very subtle flavour and reminded me a bit of the kingfish that I had back in Hiroshima. The texture and freshness of the fish felt like the most important thing here. The second one here was the Arctic char. It is a fatty salmon (fattiness makes sense seeing how it swims in arctic waters) that looked beautifully striped when sat on the plate. The fatty nature of the salmon gave this fish a richer taste than I am used to with salmon. The remaining daylight hours were spent wandering through Little Italy and Chinatown before being chased into the subway and lack to the hotel by a bout of rain that the Weather Channel didn’t predict. Honestly, There isn’t too much to write about this aside from my glee when hearing Italian Americans talking just like they do on TV. The evening was, once again, spent at the UCB Theatre in Chelsea. This time it was a double bill of shows (about 20-30 minutes each I think) put on by members of the Upright Citizens Brigade. The first wasn’t all that, but the second half (a weird adult mash-up of Sesame Street and Blue’s Clues) had me in stitches. I… actually cannot believe that this is my final evening in New York. After spending six months looking forward to being back here and it is over already. I guess I just need to plan my next New York trip.